I first shared this recipe on The Recipe Critic where I am a contributor. 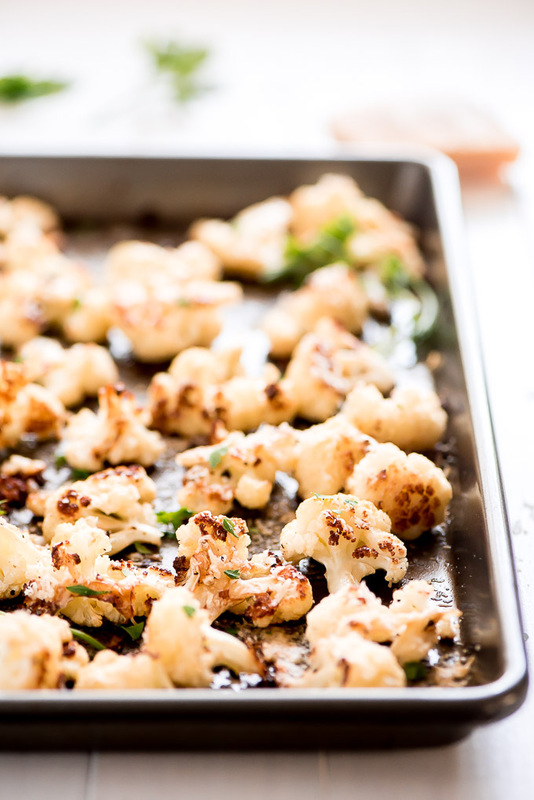 Parmesan Roasted Cauliflower is the easiest and most delicious way to enjoy this healthy vegetable. Those crispy edges are everything. PIN IT TO YOUR SIDE RECIPES BOARD TO SAVE IT! 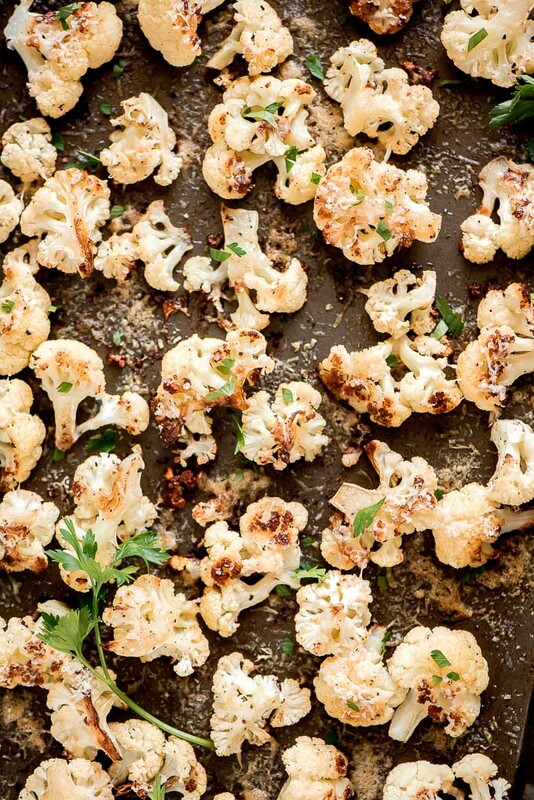 This Roasted Cauliflower is life changing! Seriously, before discovering this method of cooking cauliflower I was not a big fan. It’s alright when eaten raw and dipped in some creamy ranch dip but then I’d get bloated and have the nastiest burps (TMI?). Steamed doesn’t taste very awesome either but occasionally I’d just go for it when it was on sale because it’s good to have variety in my diet and cauliflower has a lot of great health benefits. Thankfully, now I can really enjoy this vegetable with the help of some Parmesan cheese and the roasting method. First you’ll need to remove the outer green leaves and cut the cauliflower head into bite size florets. 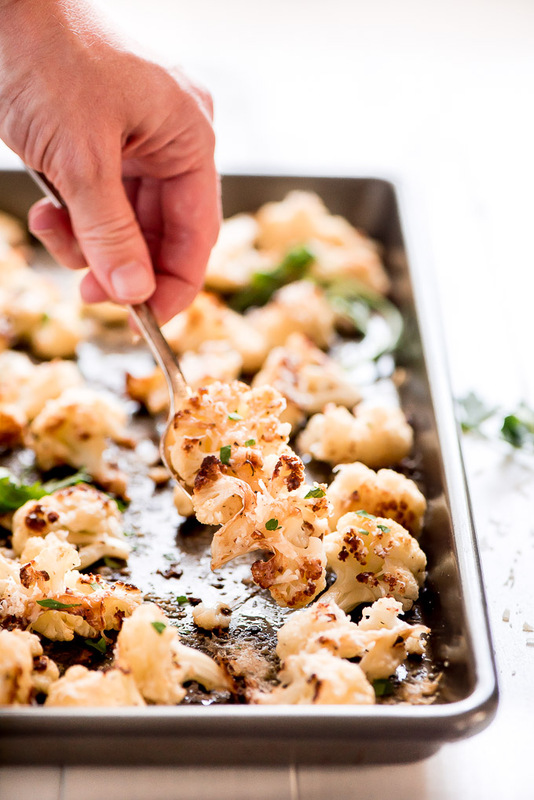 Place the florets on a large rimmed baking sheet, drizzle the cauliflower with oil, and sprinkle with salt and pepper. Toss them together with your hands and then pop them in the oven. 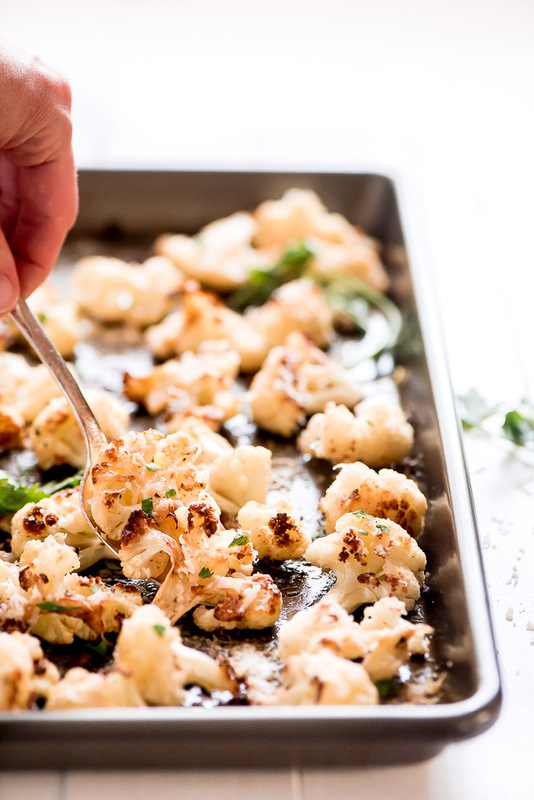 After 20 minutes of roasting you’ll give the cauliflower a toss and then sprinkle it with the Parmesan cheese and roast another 10 minutes until it’s melted and the cauliflower is nice and browned on the edges. Oh my goodness guys, you will not be able to resist snagging the florets right from the pan and popping them in your mouth. I seriously ate at least 1/3 of a head of cauliflower. I’m pretty sure that’s the most cauliflower I’ve ever eaten in one sitting. 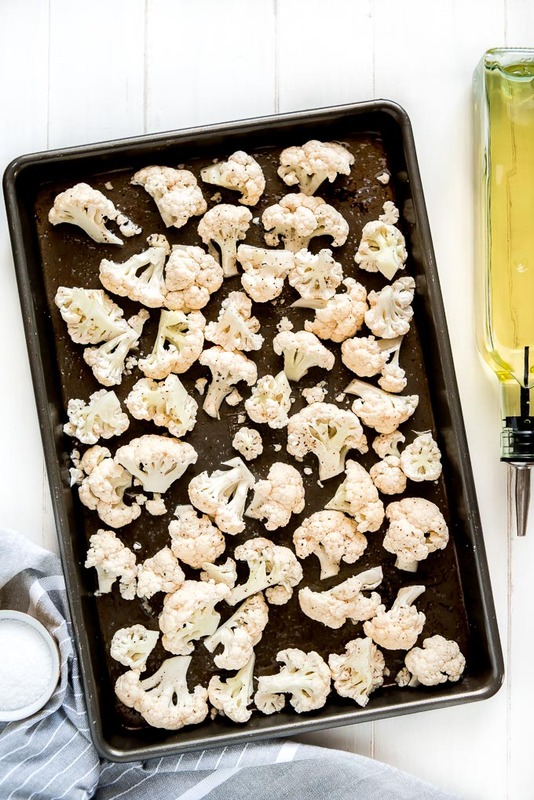 Typically, the more colorful and darker vegetable and fruits provide more nutritional benefits and despite cauliflower’s stark white appearance it actually is quite the nutritional power house. 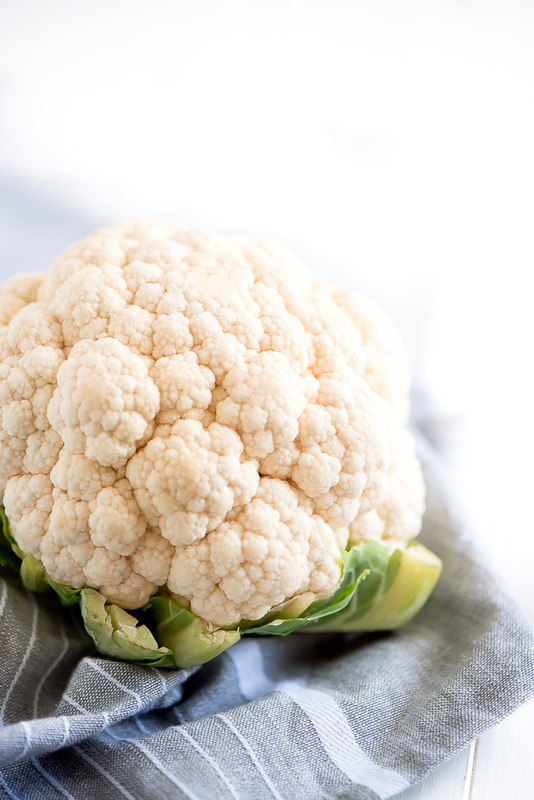 Cauliflower is classified as a cruciferous vegetable. Some other cruciferous veggies include: broccoli, cabbage, brussels sprouts, arugula, kale… Not only do these vegetables have a high amount of vitamins C & K, fiber, and minerals, they also have glucosinolates which are a sulfur containing chemical and are the ones responsible for the bitter taste and strong smell. Speaking of the strong smell, one time my 3 year old woke up from her nap after I made Roasted Cauliflower and started crying because she didn’t like the smell. Haha! Anyway, the reason these glucosinolates are good for you is because when they are broken down during preparation and digestion, they form compounds that help reduce the risk of cancer due to their anti-inflammatory and cell DNA damage prevention properties. So what are you waiting for? This not only tastes amazing but is awesome for your health! Knife Set– These are the knives I’ve been using to cook for almost 9 years. I use them multiple times a day and they’re still going strong! Cutting board– Having multiple and various sizes of cutting boards is a necessity. These are awesome because they won’t slip and slide around on the counter. Serve this along side any protein. It’s great as a side to Balsamic Glazed Slow Cooker Pork Loin or Honey Garlic Chicken. Enjoy! 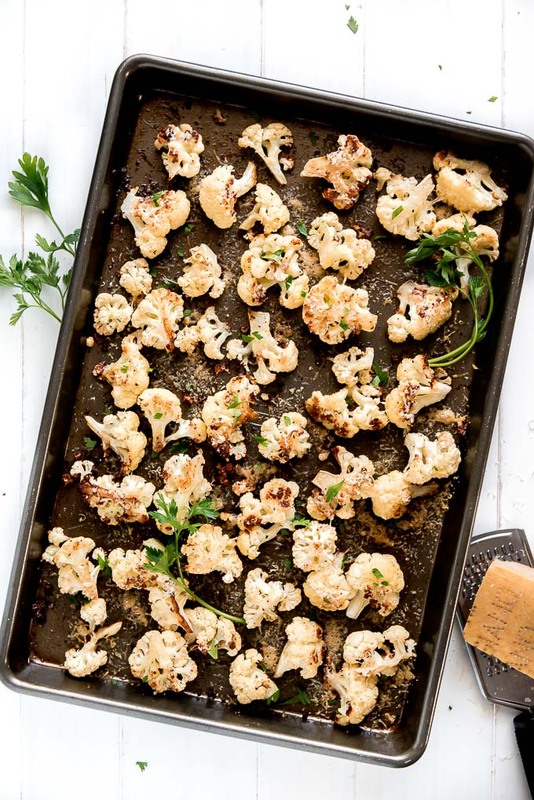 Parmesan Roasted Cauliflower is the easiest and most delicious way to enjoy this healthy vegetable. Those crispy edges are everything. Place florets on a large rimmed baking sheet. Drizzle with olive oil, sprinkle with salt and pepper, and toss until evenly coated. Cook for 20 minutes, remove from oven, toss, and sprinkle with cheese. Bake for 10 more minutes.